The last ten days have been an adventure of physical strength, mental determination and emotion. From cycling 225km under the African Sun to meeting some of the most inspirational people I have ever met in Ndhiwa, it has been a journey that I will look back and cherish forever. As I landed in Nairobi, on my very first trip to Africa, I was full off anticipation and nerves as what to lay ahead. Although I have recently set myself some gruelling physical challenges, I am not normally one to travel alone and set off on an adventure with a group of strangers. I met up with the team at Wildbeest Eco Camp in Nairobi, where we spent the evening getting to know each other over the local Kenyan Beer, ‘Tusker’. My mind was quickly put to ease as we gelled instantly, now I only needed to worry about those 225km on a bike! 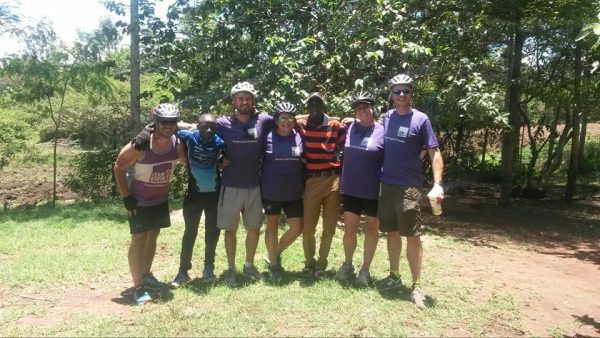 The following day, John Blissett, of Willetts Safaris briefed us on the challenge and informed us that we were in fact pioneering a new cycling route! I wasn’t sure whether to be excited about this or extra nervous! The first step was to set off in Land Cruisers to Talek, where we would begin the cycle. An eight hour drive, over dusty roads, watching African wildlife, being thrown around in a Land Cruiser already felt like an adventure to me – little did I know! Over the next four days we would travel in convoy, John leading the group in the first vehicle, the team cycling in the middle, being closely followed by Maasai brothers Moses and Josef. Moses was driving the second Land Cruiser and Josef was our cook for the journey. We arrived in Talek, a small Maasai village in South West Kenya, where we set up base at Crocodile Camp. The campsite was high up on a river bed, just far enough away from the river where two large Crocodiles where chilling out in the water. We watched the dramatic sun set over the African plains and ate a delicious Fish Stew around the camp fire, prepared by Josef. The following four days included some of the best moments of my life, alongside some of the most challenging, physically speaking. Across four days we experienced such an array of landscapes and terrain that it felt like we have crossed numerous different countries. Kenya’s beauty varies from towering escarpments, lush greenery, fields of crops, golden plains and not to mention, the vast array of wildlife around every corner. Day 1 was a fairly short day, we certainly needed to get used to the unevenness of the roads and loose rocks, this was something I had not fully prepared for – by the end of day two I could barely grip the handle bars or sit on the saddle! A highlight was finishing the first day in a local Maasai Bar, an experience I will never forget! The second day, we were warmed up and raring to go – and what an incredible day it was. We zoomed along great open plains, watching Zebra, Hyena, Wildebeest, Impala and Warthog as we went. We climbed 1500 feet up the Oloololo escarpment, having to stop halfway to let a herd of Giraffe cross the road! The 10km climb was tough but the views from the top, where we set up camp, will be cherished forever. We watched down on Lions and Elephants, ate another one of Josef’s delicious dinners and listened as our campsite host shared bush stories with us. As the sun set over the Mara Triangle we climbed into our tents and drifted off to the sounds of Leopards huffing and Lions roaring in the distance. At 5am I witnessed the African Megawatt skies, like nothing I have ever seen before, the sky was alight with thousands of stars shining down. Unfortunately, I was awake at such an early hour as I was starting to get ill.
By the time the team was ready to set off on day three of cycling I was in no fit state to join them. I begrudgingly climbed in the front of the land cruiser, alongside Josef and watched the team battle more steep slopes, winding roads and hot sun as I had an eight hour bumpy snooze all the way to Migori. In Migori we had the luxury of a hotel and hot showers, where we all got some much needed rest. The final day of the cycle challenge was tough, we were all feeling the effects tired muscles and the hot sun but morale was not down. Although I hadn’t eaten for 36 hours, I was determined to finish the cycle on my bike. The whole team kept smiling and digging deep as we climbed long, rocky inclines on the approach to Ndhiwa. I slowly nibbled on plain crackers and sipped water and glucose drinks as the team supported me the whole way. As we passed one of the schools that Team Kenya partners with, we knew we were close and anticipation and excitement grew! Arriving at Karibuni was amazing! We were greeted by the warmest of welcomes by Fridah, Millicent and Salome. The sheer relief of reaching the end of a 40 mile cycle on an empty stomach, coupled with arriving in the village where all our money raised was going to be put to good use was extremely emotional. Karibuni is a beautiful spot, in a very tranquil setting, the perfect place to reflect on an incredible four days. Although the cycling challenge was over, the second leg of our journey was just about to begin. As a team, so far, we have raised over £5,500 and we were about to witness where this money and all the money that Team Kenya work tirelessly to raise, goes. Although, over recent months I have heard a lot about what Team Kenya does in Ndhiwa, it is really hard to fully understand the work they are doing with the community or appreciate how far they have come in the last ten years with regards to gender equality. Me and the group after reaching Karibuni. Our first full day in Ndhiwa was a Sunday so we had a day of rest, of course! Our intrepid leader, John, took us out on a full days Safari – although this time we were in the Land Cruiser instead of on bikes! We visited Ruma National Park and we were lucky to spot, Baboons, Monitor Lizards, Buffalo, Giraffe, Zebra and after a few hours of searching a lone White Rhino! We travelled onto to Lake Victoria and lunch at Lake Victoria Safari Village. As a new week dawned we were excited about seeing what Team Kenya are really all about. Monday was dedicated to visiting two of the schools which they are currently partner with. There are 50 schools in the area and at present Team Kenya are working with 8, with the hope to double that in the next year. In the morning we made our way to Arina Primary School. There was roughly 500 students in the school and today nearly half of them are girls, with thanks to Team Kenya. One of the initiatives which Team Kenya introduce when working with schools is Girls’ Support Groups (GSG). In each school there are 30 girls who form the GSG, these girls are the most vulnerable within the school. As some of these very special girls were introduced to us, stating the reasons for their need to be in the GSG, in a very matter of fact way, I couldn’t help but watch them and admire the strength and resilience which appeared to beam out of them. The GSG at Arina prepared a dance and song for us and after they were finished, I presented them all with a Friendship Bracelet which had been made by my network of strong, independent girl friends in London. It was a small token but I hope that when they wear those bracelets they remember that they too are strong, independent, empowered girls. Team Kenya provide these girls with essentials such as solar powered lamps so they can study when there is no electricity, sanitary products so they can continue to attend school. They also meet with their mothers regularly to help educate them and provide business loans and agricultural training to provide them with a sustainable way to support their families long into the future. I was lucky enough to join one of these sessions with the mothers on my fourth school visit, to Bongu Primary School. I heard from 20 mothers about what they currently grow on their land and how Team Kenya Agricultural training has impacted them. On average these 20 women make 147% more income from their land following the training Team Kenya provides and on top of that these women also run their own businesses, thanks to sessions held with Team Kenya and access to small business loans on average these women are making 160% more from here too! These women were truly inspirational to meet and it was amazing to see how they have implemented their training with pride and reaping the success! The second school which we visited was Ndhiwa Community Hospital School. Here, I joined a lesson where the kids were learning to distinguish been good and bad people and places with the community, I joined a very dusty game of handball and then nearly got mobbed when handing out 100 balloons for the kids to play with! The smiles were contagious and incredible heart warming. Although school life is very basic, compared to UK standards, in every school I visited in Ndhiwa I was struck by how happy all the children seemed. At this school, like most others that partner with Team Kenya, they have access to fresh, filtered drinking water thanks to tanks and filters installed by Team Kenya. The Hospital School need more tanks to cope with their growing population. Money raised by Team Kenya will help to fulfil these needs sooner rather than later! To see this direct impact of Team Kenya fundraising was a really important moment for me. The third school I visited blew me away. Kodougo Primary School have been working with Team Kenya for three years and have taken full advantage of everything Team Kenya have supported with. They are fortunate to have a lot of land and have utilised much of it to its full potential. They have a ever growing Banana plantation, a large part of it managed by the Scouts within the school. They have planted over 1000 Eucalyptus Trees which can be cut down and sold every 7 years, generating significant revenue. They are rearing sheep on site for additional money. All of this is happening whilst 10 teachers look after, nurture and teach over 800 pupils. Reception class (the babies of the school) are taught outside under a large tree due to over crowding. Many of the classrooms lack windows and doors. However, the children are all laughing and smiling. The drive, passion and determination of the teachers is beyond inspiring and blew me away, especially that of deputy head, Maxwell. Continued support from Team Kenya combined with the drive from these teachers will ensure that this school continues to thrive and improvements will be able to be made over time. Being introduced to just a few of the projects that Team Kenya are working on with the community in Ndhiwa has been awe inspiring. Every penny raised back in the UK goes so far in making the lives of this community better. Girls are beginning to outnumber boys in education, mothers are doubling their income and improving their knowledge of gender equality, more and more children are able to attend school and have access to clean, fresh water. 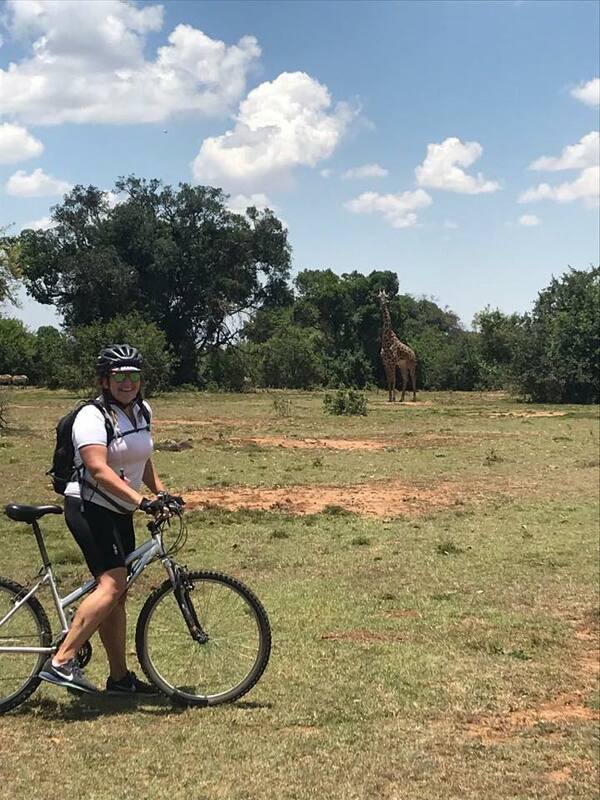 I might just get back on my bike and cycle back to Nairobi if means more money raised…..
You can find out more about the Kenya Cycle Challenge here. Want to read more stories like this? Subscribe to the Team Kenya mailing list.